The long weekend in finally here, woohoo! I am celebrating after this week, it was insane at work with project stress and co-worker drama. The last two days have been a blur here with Valentine’s Day fun and work, but here we go! I finally set up a YouTube profile with a whopping one video so far. And it’s not a great one shot from my phone with bad lighting, sorry. But this is the toy dance Miko does when he wants us to throw his toy. And he’s always full of energy when I get home from work ready for an hour or two of toy throwing. I started Valentine’s Day with a huge chocolate banana smoothie for breakfast. 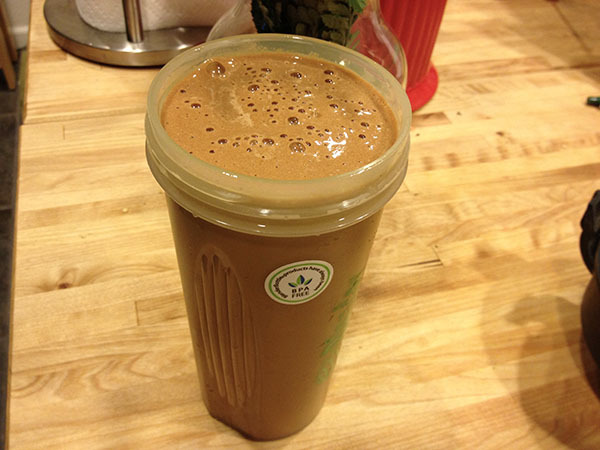 It’s packed with frozen banana, raw cacao powder, Garden or Life’s Vanilla Raw Protein, spinach, and a couple of carrots. 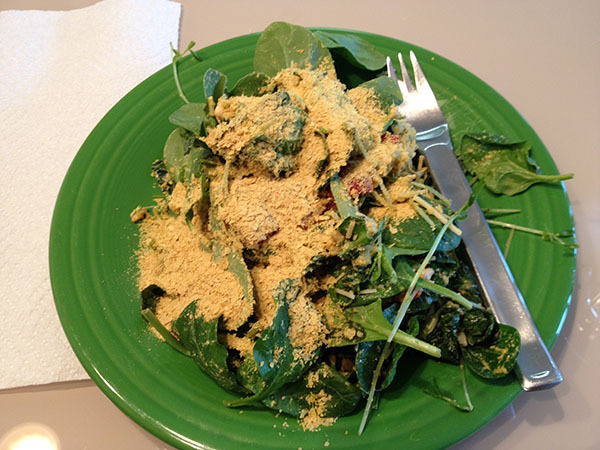 For lunch I mixed two small servings of salad leftovers and topped with nutritional yeast, yum. And when I got back to work, these gorgeous roses were waiting for me thanks to hubby. 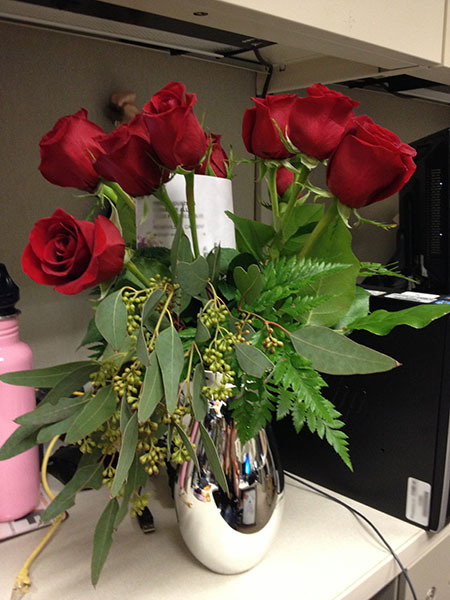 And I was thankful because they smelled a lot better than nearby co-workers and brightened my cube nicely. For dinner, I made surprise reservations at hubby’s favorite restaurant, The Chef’s Table. It’s a fun little place where the head chef prepares fast meals in the center of a bar with dining tables stuffed around the bar and you can either sit at the bar and watch the action, or sit at a table. Because the place is so small, reservations have to be made about a month in advance for holidays, thank goodness for OpenTable: Sacramento Restaurants. But the small menu rarely has a lot of vegan friendly options, there was even a bacon brownie on the menu this time – ugh! Luckily they never have a problem creating something custom for me that’s usually a sampler plate of vegan side dishes and/or a custom pasta dish. 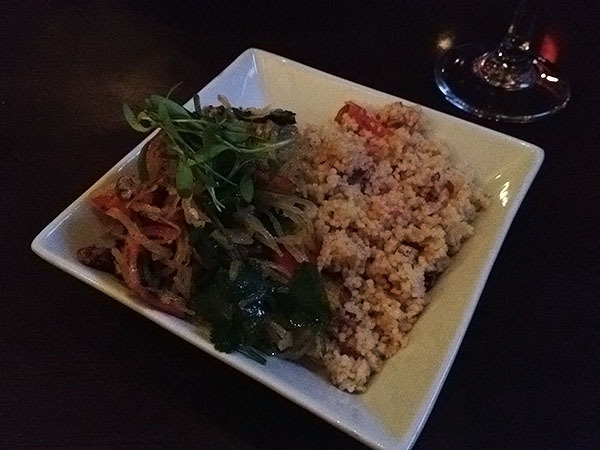 This time it was a tasty chilled spaghetti squash salad with a savory couscous side for a beautiful plate. Since we went out for Valentine’s Day, I had every intention of staying home last night and making something cheap for dinner. But after another insane day at work, I just was not feeling inspired at all! 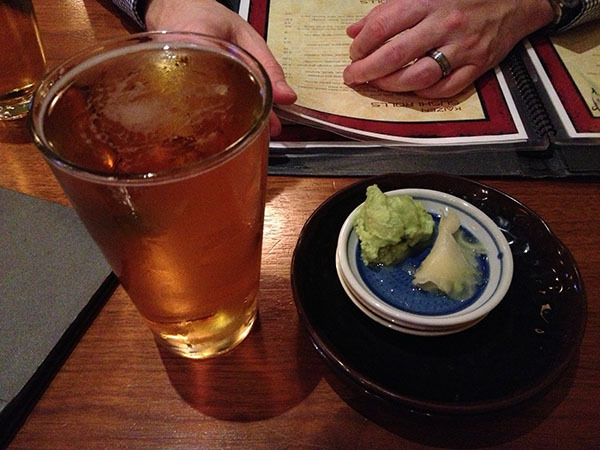 So sweet hubby took me to a local sushi place, Kaizen, for a simple dinner that started with Sapporo beer. 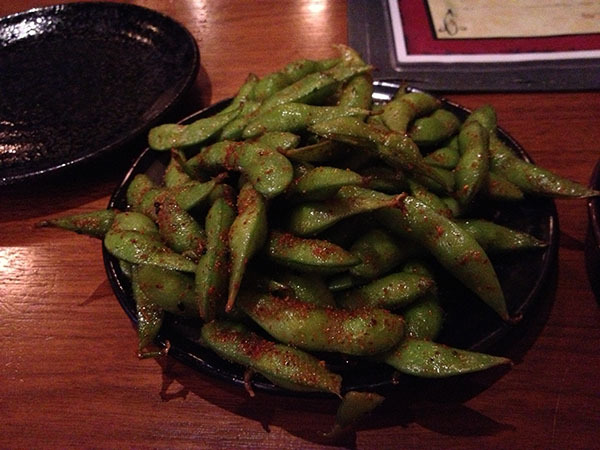 And spicy edamame for an appetizer. Then The Rabbit sushi roll that is probably one of the best vegan sushi rolls I have ever had. It’s packed with greens, avocado, asparagus, and fried soy, served with a sweet soy dipping sauce. 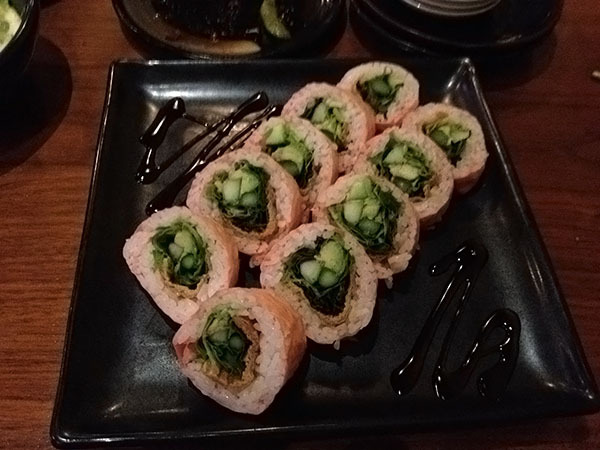 I usually avoid vegan sushi rolls because they’re so plain compared to the non-vegan versions – plain cucumber or avocado rolls with just rice. They’re not bad and way healthier, but not exciting. This roll is exciting with texture and flavor! Blah work drama is never good :( Hope you have a relaxing weekend. Your dinner looks like it was a lot of fun, and the sushi looks delicious!! So true on work drama, hoping things settle by next week! You too on the weekend, so exciting about your book! Yes, these things take time. Thanks so much! What is it with people and their drama? I have been dealing with that at work too. I am happy for you if a wee bit envious of your 3 day weekend. And I realize its been too long since I made a chocolate banana smoothie! Agreed on drama, I’ve can’t stand bringing it into the workplace and not sure why some would want to. Thanks on the weekend, so grateful for it and I hope you get a long, relaxing one soon too! gosh i love your video! and love all of your food. i still wish you could be my personal chef. i would be so happy and healthy! Awesome, it took me awhile to set up a YouTube account and get a video up there! 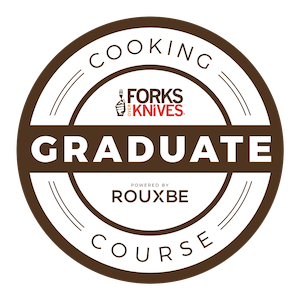 :-) But more to come and maybe even recipe demos! Agreed on nutritional yeast, I could go through so much of it!